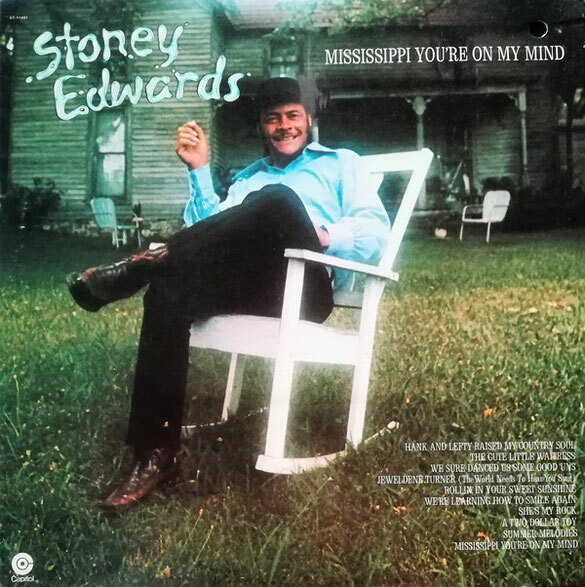 In this week's episode, we're featuring "Mississippi You're On My Mind" (1975), a Capitol Records compilation of Stoney Edwards' early work on that label. The music is country gold, but Stoney's story almost beggars belief. Born in Oklahoma, he moved his family out to San Francisco where he had a horrific workplace accident - trapped in a sealed tank, he ran out of oxygen and inhaled severe amounts of carbon dioxide before he was freed.. the doctors said he was terminal, but within two years he was writing and recording country music again. Indeed, it was at a benefit that he organised for Bob Wills (at the time in ailing health also) that led to his signing with Capitol Records. That this music even happened is somewhat of a miracle, and Stoney's hard country style on this album is best exemplified in his biggest hits: "She's My Rock" and "A Two Dollar Toy", but other highlights include the wholesome "We Sure Danced Us Some Good'uns" and the banging "The Cute Little Waitress". The story of Stoney Edwards is one you'll want to hear.